I've gotten a lot of emails asking, "what's top dead center? ", "where's 9° ATDC? ", "How advanced is too advanced?". This write up should cover most of these. Time for a little shade tree ignition timing! Let's say you don't have a timing light but you've replaced your distributor or something and now your timing is way out of whack. Don't sweat it! It's easy to get it fixed. 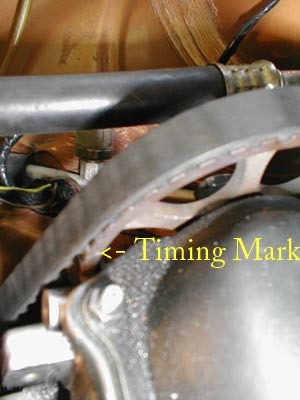 Keep in mind that this is not a REPLACEMENT for using a timing light, but rather a solution to being in a pinch or a good place to start when getting your distributor lined up properly. Step one: Disconnect vacuum lines going to and from the distributor. The vacuum retard and advance can vary your ignition timing and therefore, do not need to be attached. We check timing at idle, so we do not want any kind of vacuum adjustment on the distributor. Just make sure to plug up the lines so you do not create a vacuum leak! Step two: Find your zero marks! All of your VWs have marks on the rotating parts to denote 0° TDC. 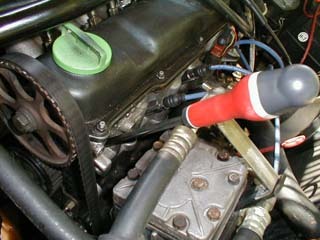 The cam has a dot or hash mark that lines up with the valve cover. The flywheel has a notch that lines up with the center of the hole on top of the bell housing. With the car off, put the car in fourth or fifth gear and roll it until the zeros line up on the cam (see photo to the right) and flywheel. 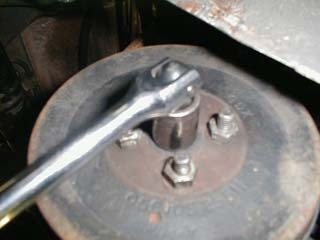 You can also just take a 16MM socket wrench and turn the crank (see picture below). Please only turn the crank clockwise. For extra measure, it may be a good idea to pull the spark plug out of the #1 cylinder and drop a screwdriver in the hole (see picture below). When the screwdriver is all of the way up, you're close to 0°. The distributor has a slash that lines up with the rotor. Loosen the 13 mm that holds down the distributor and turn it until the hash mark on the distributor lines up with the rotor. Now the rotor is pointing at zero as well. Step three: Crank her up. "Putt Putt Putt". Yeah, you don't get the best performance at zero degrees. Time to advance the timing. Grab the distributor (not the wires) and slowly turn the unit counterclockwise. This will advance the car. You may notice the idle go up. Back up to the point where the idle just begins to go up and cinch down the distributor. Take her for a spin! Should be good. If you're looking for more advance, be careful. You may notice a sound similar to water from a lawn sprinkler hitting a metal fence pole. That's pinging. That's the sound of detonation inside the head transferring to the exhaust manifold where you can hear it. You may also notice the car running a little hotter than usual. Back the distributor back down and proceed as you see fit. I know on my '82, unless I use 92 octane, my Rabbit pings like a mother when the idle is on the peak of the curve as you advance the distributor. That's at only 8:1 compression! This is why I choose to set the distributor on the upward slope of the idle increase. I could chart out what different timing settings each behavior represents, but this would not be practical since I've found different cars react differently at different degrees of timing. One thing I have found to be common is, when advancing the timing from point zero, the idle goes up. If the idle is at it's peak, it's usually to high. Real simple. If you whip out the timing light (and you probably should eventually), you'll probably (probably) find yourself between 5-7° ATDC.